Masoom, Masoom…Makhan, Makhan. Looking at the ad, I had one of those flashback moments you see in comedy scenes from old movies, where a memory-trigger is followed by a ululating sound and images of bright concentric circles, and you find yourself in the past. I was six when Masoom released, the film was very popular in my household – not least because of a conceit that at that age I looked like the cherubic Jugal Hansraj – and around this same time I had a habit of orchestrating little “picnics” on my grandmother’s bed on weekend mornings. The fridge would be raided, out would come many little plates with bread slices, jam, cheese, occasionally salami…and of course, the butter. I didn’t have much brand-awareness back then, but I remember holding the fresh packet, still cool and hard, and rolling the words “a pat of butter” over my tongue. I was fascinated by that word, “pat”, which I had come across in a children’s book. No one would use such a word for butter in my house, it belonged to the faraway world of Enid Blyton’s scones and macaroons and potted pies – but the Amul packet brought the Famous Five’s Kirrin Island excursions closer home. Today, like Urmila, I’m all grown-up – there are no fantasy picnics – but some things haven’t changed. One is Amul, still encountered every day at mealtime. Another is Hindi cinema, which I spend a great deal of my professional life thinking and writing about. And there are the ways in which these two things have intersected over the decades via those delightful ads, nearly as ubiquitous as Bollywood itself. Romanticizing the past, making it seem simpler and more idyllic than it ever was, is something we all do. So when I look at the older Amul film ads, my first reaction is that they are so direct and minimalist. The one for Amar Akbar Anthony (or “Amul Akbar Anthony”), for instance, has the three brothers in their readily identifiable garb, each biting into bread. “Roti, Kapada aur Makkhan” has a neta in white, holding up a buttered slice. Or there is the moving tribute to Raj Kapoor: no text, just the legendary showman dressed up as his emblematic character, the clown from Mera Naam Joker, waving out at all of us. But even with these “simple” images, you wonder: is the joker wearing an apron? That painted smile on his face, is there a tiny dab of butter hidden in it? A drop of Amul running down the politician’s kurta? Such is the history of these ads, and our associations with them. You have to look again, and then again, to catch little things you missed. And in this sense, these ads have something in common with the best of old Hindi cinema: they are unassuming if you give them only a casual glance, but become sharper and cleverer when you look more closely. There is a prevalent view that today’s “multiplex” films have become edgier, more nuanced, having moved away from tropes and archetypes of the past. There certainly is something to this idea, but it doesn’t recognize how many of the older films, while being products of a particular time and culture, contained unexpected depths. Working on a book about Hrishikesh Mukherjee recently, I became increasingly appreciative of the layers hidden beneath familiar surfaces; how even seemingly innocuous movies like Chupke Chupke or Guddi were often ahead of the curve in their depiction of class or gender conflicts, how they contained gentle but clear-eyed satire on the workings of our society, even as they operated within safe, domestic, middle-class settings. Gentle satire is something the Amul girl – who would fit right into a Middle Cinema household, a benevolent version of the enfant terrible – specializes in too. No wonder the ads have never lost their capacity to stimulate and sometimes startle, even though the concept is so direct, and even though the mascot has remained the same chubby doll for decades. The willingness to take on any issue under the sun, the wordplay (“Rich taste se hum sabke baap lagte hain,” booms Shahenshah “Amultabh Makkhan”), the little visual touches (the Kashmiri Hamlet in Haider holding up not a skull but a plate of a large, misshapen mound of butter – you couldn’t call this a “pat”! ), the delicate taglines (“Every Bite is Special” for Taare Zameen Par, a reference to the special-needs child who is the film’s protagonist) – it all adds up so well. In the past 20 or so years, the ads have been a little more cognizant of how Bollywood has become fashionable and global, and how the conversations about films are no longer just about (or mainly about) the films themselves: they are about the stars, their very public romances and rivalries, the behind-the-scenes doings. The Salman Khan case. The IPL matches. The fact that two big-budget films – the Shah Rukh-starrer Dilwale and the Bhansali opus Bajirao Mastani – came out on the same day. (“Released daily” is Amul’s droll description of itself here, a reminder that some blockbusters don’t have to be waited for!) They are aware, in our media-saturated age, of the stories behind the stories. They are also aware of how iconic Bollywood references can be used to comment on real-world events in other spheres: the play on the Deewaar line “Mere Paas Ma Hai” in an ad depicting the split between the Ambani brothers Mukesh and Anil; the use of famous song lyrics in unexpected contexts, such as “Dosh Dosh na Raha” in an ad about a housing society scam involving four former chief ministers, or “You are my Sania” for Sania Mirza. 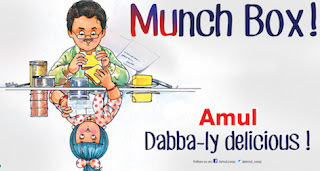 And to me, one of the wonders of the Amul ads is that they have managed to retain their charm and subtle wit even while dealing with material that is sometimes best suited to shrill Page 3 tabloids. Do I have a favourite? It’s nearly impossible to pick, but look at the one for another cherished childhood film, Mr India. “Formula that makes food disappear,” it says, a reference to the invisibility theme. That would be a good enough Amul ad, you’d think, but no, the creative team wasn’t done, they wanted something more – so they added a little reference to the heroine, an “UtterSri Devicious” at the bottom. For me, as an outsider, this is a glimpse into the playfulness and inventiveness that lies behind the making of these ads: how they toy with word arrangements, allow themselves to be cheesy if they think it works in a given situation, find little moments of inspiration tucked into a sentence, like a dab of butter transforming the texture and taste of a hot aloo parantha. 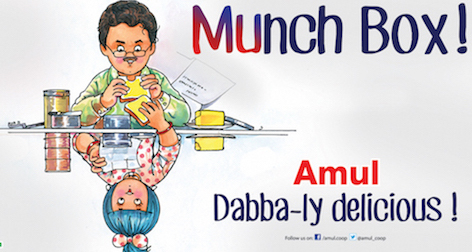 So thrilled to read this piece - love the Amul ads - sometimes I waited for them as eagerly as I waited for a film to release. Memories of coming back home from college,reading Amul Ads from a Banner right outside railway station, Remember choking up a little when I saw them pay tribute the great Amrish Puri,He was in the Mogambo Avatar, the Amul girl holding his hand & the caption said 'Mogambo, Dukh Hua'!